Jamela A Ali's career as an Attorney at Law spans over 29 years. The Principal of the Ali Law Firm that provides Guyana legal services in Contracts, Oil & Gas, Mining Law & Agreements, Property matters, Trademarks & Patents, Adoptions of Children, Divorces, Probates of Wills and Administration, Money Claims, Formation of Companies. She is the founder of GOGCO. Jamela commenced her legal career as a State Counsel at the Attorney General’s Chambers, Guyana and held senior positions. Click here for views of clients! Ms Jamela A Ali has the distinction of making several lead appearances at the Caribbean Court of Justice (CCJ) Trinidad and in the Courts of Guyana, Court of Appeal of the Supreme Court of Judicature, Full Court, High Court (Constitutional & Administrative, Commercial and Family), Land Court, and Magistrates Courts. Her mission is to provide an efficient and outstanding professional lawyer client service leading to the clients’ success. 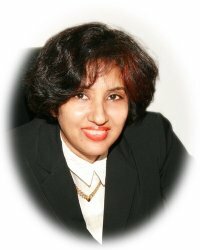 Ms Jamela A. Ali is an Intellectual Property Agent (TradeMarks, Patents, Designs) in Guyana. Ms Jamela A. Ali holds a Masters of Law degree in Legislative Drafting which included the Public Law courses of Constitutional and Administrative Law and a Research Paper written on Legislative Drafting, Parliamentary Counsel, Statute Law Revision, Consolidation of Laws, Law Reform, Constitution, Natural Justice, and Good Administration. Services are provided with regard to the review of Acts and subsidiary legislation. Ms Jamela A Ali is considered one of the leading Mediators. She is the founder of Mediation Services International (MSI) providing ADR services and Mediation training. She was the Past President of the Mediation Institute of Guyana Inc.(now defunct*) As President, she initiated and managed the successful hosting of the first International Mediation Conference in Guyana. Presenters included Justice Vasheist Kokaram of Trinidad, Carl Singh, former Chancellor (ag) and Jamela A. Ali, Attorney at Law. Jamela is a Member of the Chartered Institute of Arbitrators, London and was awarded the Advanced Certificate in International Arbitration. Her diverse background in Litigation, Arbitration and Mediation serves as a valuable resource to clients, providing unique and innovative insight in practicing litigation avoidance by strategising and negotiating in the settlement of disputes. Jamela is the author of articles on Adoption of Children laws, Constitutional law, Administrative Law - Duty to Give Reasons, Legislative Drafting, Law Revision, Legal Practitioners Committee and Mediation, which have been published in the New Guyana Bar Review, Caribbean Law Review, Guyana Chronicle, Stabroek News newspapers, the Al Bayan and on websites. She has also delivered speeches on Constitutional Law Reform, Human Rights, Legislative Drafting, Mediation and Family and Matrimonial laws relating to Children & Women and appeared on National Television. Notary Public - Jamela was appointed as a Public Notary for Guyana in the County of Demerara on the 8 day of September 2014. This web site is in the course of construction.